Confession Time: Reading is probably my least favorite subject to teach. Scandalous I know! I am more of a hands-on, out of your seat type and it is hard to make reading just that. I think it is why I have enjoyed vocabulary so much. I can take vocabulary and turn it into a hands-on activity. Alright, alright. This activity isn't actually hands-on, but hey, you have to start somewhere! At the beginning of my unit, I incorporate a bit of phonics work while introducing my vocabulary for the week. I cover all the letters of one of the words, except for the first letter. I ask the students to give me 3 good guesses as to what the word could be. Then I uncover the next letter and ask if the words they gave me would still work. If not we think of 3 more words. Then we add a third letter and the students give 3 more word guesses. I have my students make one straight line facing me in the classroom. I ask students questions about the words and when they answer it correctly, they walk around our desks to the back of the line. I try to make the questions short and fast, so I can keep the line moving. For example, the first time or two the students go through the line, I simply ask them to read the word. This helps my struggling readers become more familiar with identifying the words. Next level up, I will ask them to tell me what the word means or to act it out. Then, they might have to use the word in a sentence. This is my favorite out of all the activities, because I have seen my struggles succeed with this method. We make vocabulary sorts with cardstock paper and my students sort them once per day. It takes just 5-10 minutes, but the pay off has been rewarding. Sometimes I type up my sorts and other times my students create their sorts. My favorite way is to have the students create three columns and write the words in one column, the definitions or synonyms in the middle and sentences with the vocabulary words missing in the last column. We do this on cardstock paper, cut out the rows and then draw matching symbols on the back of the matching word, definition and sentence. Then they cut those three pieces apart. We keep them in a sandwich back and practice them once a day. It also makes for a quick and easy homework assignment. If you have tablets in the classroom, my favorite app is Quizlet. (You can also play from the computer.) I have been using it for free the last 3 years and I have built up a nice list of vocabulary activities. For example, I have every singe one of our science vocabulary words saved in the app by chapter. You can search for a vocabulary list that others have created or you can create your own. Our favorite activity is called "match" or "scatter" (same concept, but on the computer it is called "match" and on the tablet it is called "scatter").. It is just like memory match. Oh, and did I mention it is FREE? This is a get 'em up and moving game. I have blogged about it before at my Amber from TGIF blog, so check that post out here. But here is the quick summary: Students walk around the room while music is being played and stop at the closest corner when the music stops. I will have the vocabulary words (say 2 words to a corner) taped up in that corner. I will announce the definition, sentence with the vocabulary word left out, or an antonym or synonym. If they are standing at the corner of that word, then they are out. We keep playing until we get most everyone out. Have students make a poster or mini book with their vocabulary words. Have them draw a picture to describe their word, write a definition, a synonym or antonym, or use it in a sentence. Want some pre-made posters or mini-books to use? 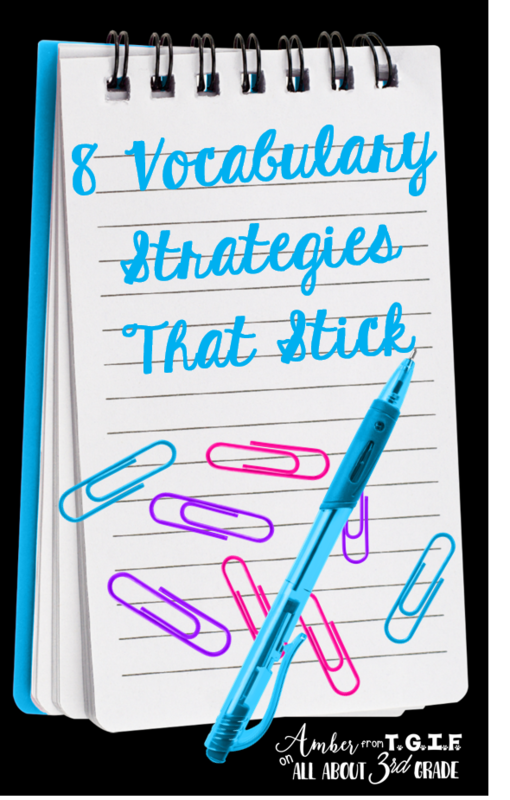 Check out my vocabulary resource in my TpT store. This probably isn't a new concept, but maybe you haven't tried it in awhile because you forgot about it! Write the vocabulary words on note cards and have a student pick one and then try to act it out. The class (or teams) try to guess. Make two teams and compete against one another. Have students hold one of the vocabulary words up on their forehead (without having looked at the card first). They can mill around the room and ask different students different questions until they are positive they know what the word is. They should ask yes or no questions like, "Do I start with a vowel?" or "Can I use this in the classroom?" P.S. Some teachers have the headbands from the Headbandz game, but I have seen some teachers use plain headbands from the ladies hair department and they work great! What other vocabulary strategies work for you in your classroom? I am always looking for new ways to practice!